The United Nations sees sport as an important and powerful tool with the potential to progress towards the 17 Sustainable Development Goals. Street Child United supports the SDGs. We use sport to bring street children together in a safe space where they can be seen and their voices can be heard. Ahead of the world’s biggest sporting competitions, like the FIFA World Cup, we put on international sports events, specifically for street-connected children. 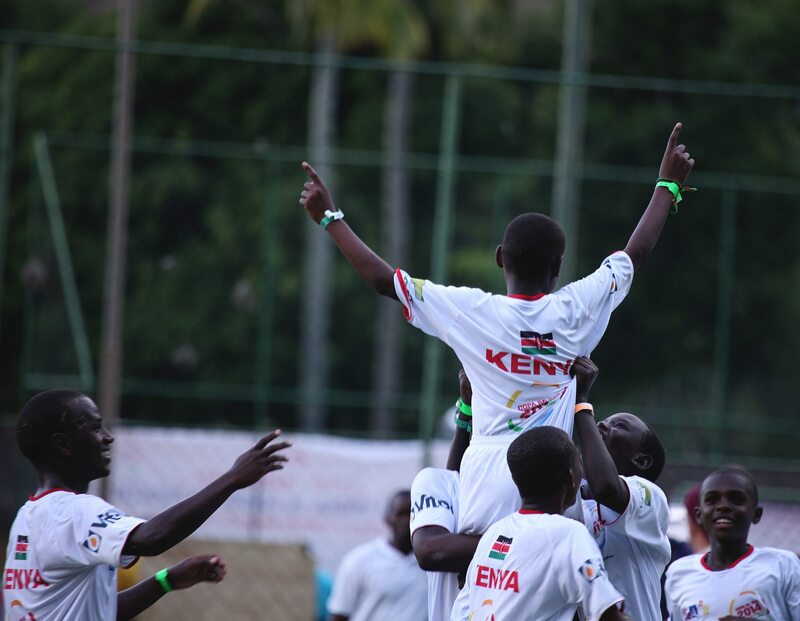 Kenya celebrate a goal at the Street Child World Cup Rio 2014. By its very nature, sport is about participation. Many of the organisations we work with use sport every day to build positive relationships with children on the streets and start the conversation around how best to support them moving forward. People are used to seeing street children in a negative light. For young people who take part this is a chance to be seen not as street children, but as athletes and ambassadors, judged not for their background, but given the space to be their true selves and make their country proud. Sport has no language barriers. It’s a way for young people to make friends from other countries, share experiences and come up with ideas for the future. Sport promotes equality, inclusion, and participation, whilst increasing confidence, happiness and resilience. Inspired by their experiences, some of the young people who have taken part in our events have gone on to be leaders in their community and role models for other street children. Drika, lifted the World Cup for Brazil and now coaches children in her community. Sport has a unique power to attract, mobilise and inspire. We use sports events as global outreach platforms for street children to send their message to the world.